Happy November my friends! Halloween is done and we are now onto the gratitude month. There are so many things I am grateful for. I realize how blessed my life is and I am super grateful to share bits of it with you. Thank you to those readers that literally come daily to check out what I do. You mean the world to me. Spring isn’t quite here in Indiana, in fact it snowed yesterday. I swear this is the longest winter in the history of winters! However, I have faith that only a couple of more weeks and Spring will be here to stay. I can’t wait to see my first daffodil blooming! 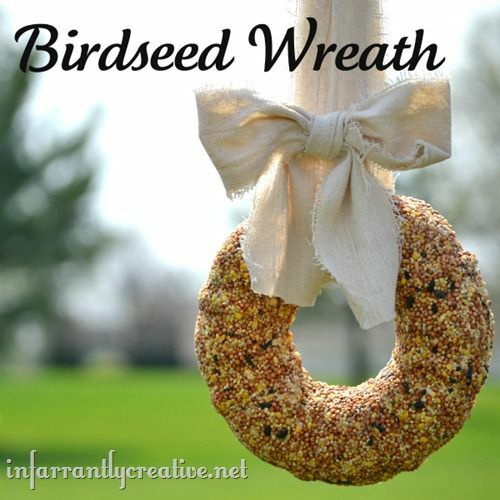 Making a birdseed wreath is a fun way to welcome in Spring. These are so simple to make and would make great hostess or housewarming gifts.